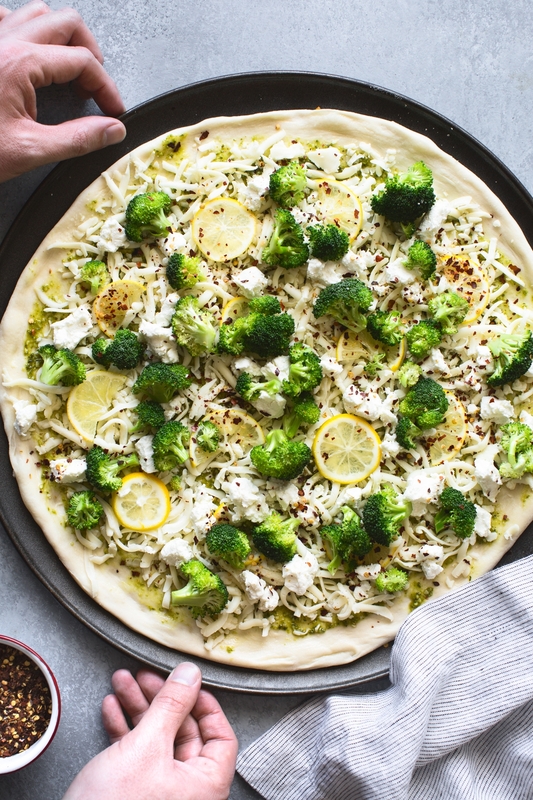 This Lemon Roasted Broccoli Pizza recipe is for those of us who like pizza, but also want to eat a small healthier in the New Year. Homemade pizza is something I like to make year-round. My healthy compromise each January is to load up my pizzas with more vegetables. I also like to eat fewer slices and pair them with a small side salad. 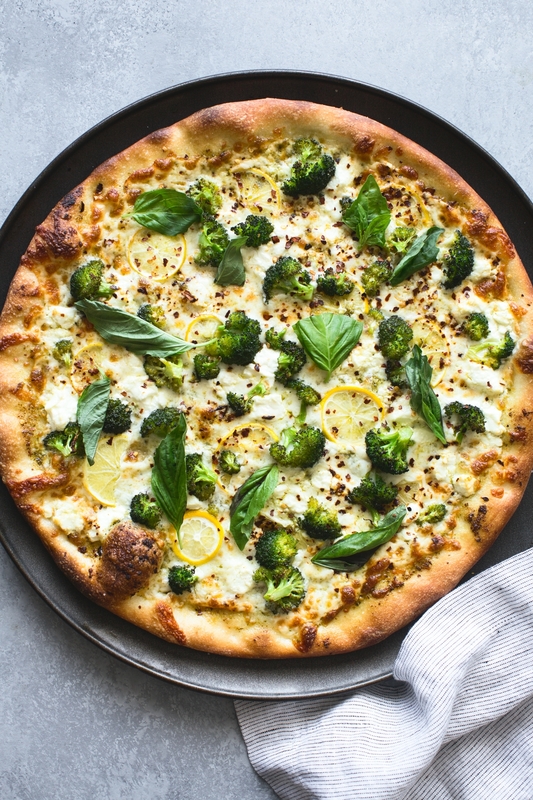 Topped with pesto, broccoli florets, low-stout mozz, goat cheese and thin slices of Meyer lemon, this vibrant pizza is packed with flavor and nutrients. 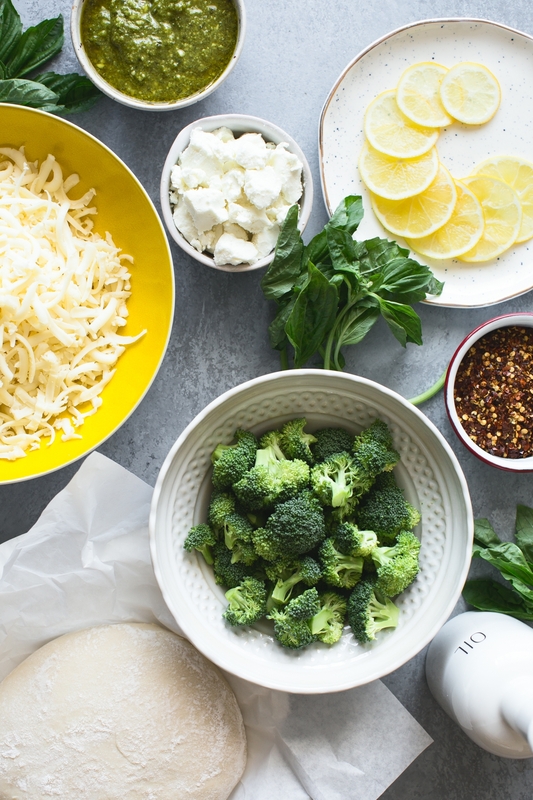 The broccoli is simply tossed in olive oil before going on the pizza. As the broccoli cooks in a screaming hot oven, it will soften a bit while getting crispy and golden at the edges. Small pieces of lemon scattered about the pizza provide pops of acidity. I’ve used a Meyer lemon here because they are in season right now, but you could certainly use a regular lemon instead. Continue reading for the recipe. This is a white pie, so there’s no tomato sauce base. Instead, I’m using a pesto, a green sauce made with basil, pine nuts, olive oil, garlic and Parmesan cheese. This recipe only calls for 1/4 cup (store bought is fine). When spreading the pesto over the dough, it may seem like you need more, but resist the urge to spoon more on! If you add too much pesto, the pizza will get really oily and sogged out. Preheat an oven to 500°F, and set an oven rack in the lowest possible position. Lightly coat a pizza pan with nonstick cooking spray. Stretch pizza dough into a round large enough to fit the pizza pan. Very lightly drizzle the dough with olive oil, using your hands to evenly spread the oil around. Sprinkle dough with a small pinch of kosher salt. Top pizza evenly with pesto and grated mozzarella cheese, then scatter lemon pieces and goat cheese over top. Toss broccoli with 1 tablespoon of olive oil, then scatter evenly on top of the pizza. End with a sprinkling of kosher salt and crushed red pepper flakes. Transfer pizza to the oven on the lowest rack and cook until the crust is golden brown (bottom and crust) and the cheese is nice and bubbly (9 – 11 minutes). End the pizza with a sprinkling of chopped basil. 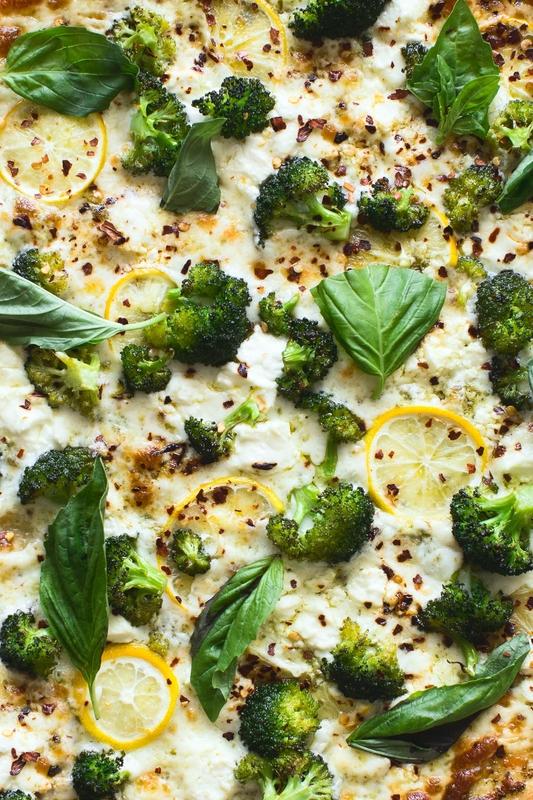 Be the first to comment on "Lemon Roasted Broccoli Pizza Recipe"